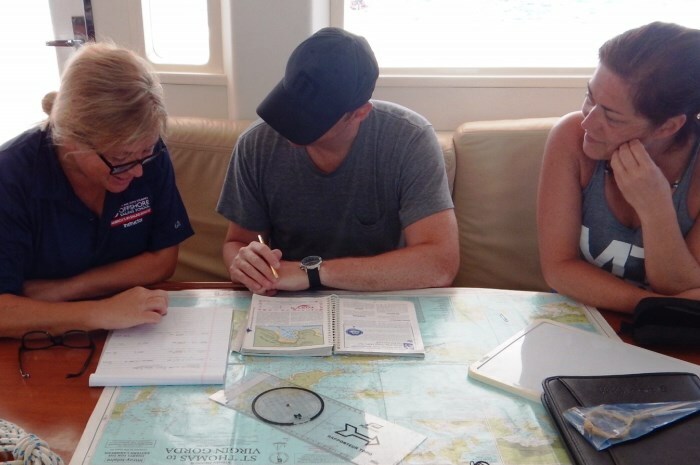 During an Offshore Sailing School coastal navigation course (OSS 105) you learn electronic navigation with emphasis on back-up piloting, using traditional navigation aids. You may think with GPS, chart plotters, and other electronic aids you don’t need to know the theory and techniques of piloting with charts and the stars. When batteries die and electricity fails on your boat, you always should have a back-up, and that’s what you will learn in our comprehensive sailing navigation courses. Join a boat navigation course below and get in touch if you have any questions. This comprehensive sailing navigation course is occasionally offered in our shore classrooms over a two-day period, following two days of home study. You may also take it in conjunction with our Coastal Passage Making Course, as the first two days are all about Navigation. During this time you work through the US Sailing Coastal Navigation Course textbook exercises with an expert Offshore Sailing School instructor. In this coastal navigation course you learn the skills of traditional piloting with chart, compass, parallel rules and dividers – all navigation aids you should have on board when you set sail or rev up your engines for short and long distance voyages. 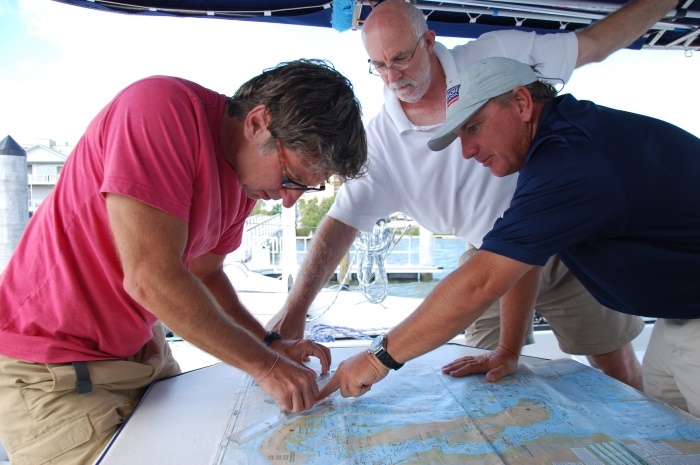 The two-day classroom Coastal Navigation Course is available on select dates at our Florida campuses. No sailing experience is required if you are just taking the shore-based navigation portion of a passage making course. Packages above for the two upcoming course dates include accommodations. Travel, meals and other costs are extra. Offshore Sailing School knows we cannot thrive without great employees and products. All graduates are asked to fill out an evaluation at the end of the course. The following testimonials come from those evaluations and individual correspondence with recent graduates of the Catamaran Live Board Coastal Navigation Course, or shore-based navigation courses. Many are happy to correspond by email or phone with you. If you would like us to put you in touch with anyone below, please call 888-454-7015 or email sail@OffshoreSailing.com.